Thousands of people each day go to an office for their regular job and end up spending forty or more hours at their desk. As a long-time sufferer of back pain, I know all too well the complications that these long hours can have on your back. In my last review, I discussed how finding the best office chair can help ease those aches and pains. While this is a good start, it does not solve all your health issues that can come from an inactive life style. One way to tackle this sedentary lifestyle is to invest in a standing desk converter to turn your regular office desk into a standing desk for better blood flow and to work your muscles throughout your day. Here are three of the best standing desk converters you can use with your own desk. 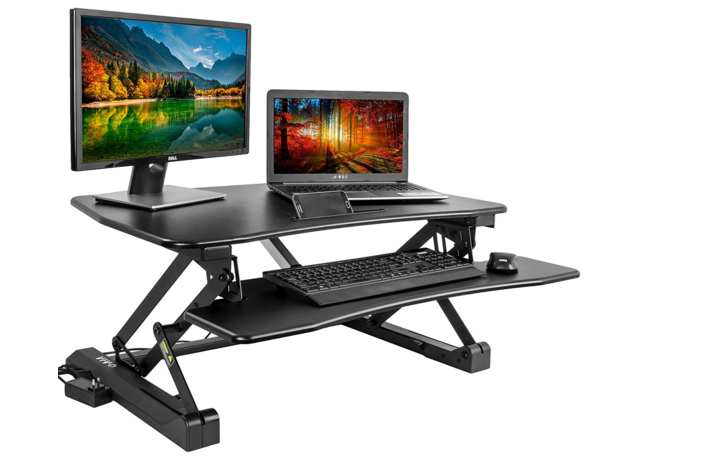 Many of the best standing desk converters offer the same features. 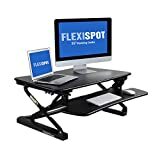 What makes the FlexiSpot M2B Standing Desk stand out above the others is that it has a large workspace, a higher rise, and a unique space saving rising function that is different than all the other designs. 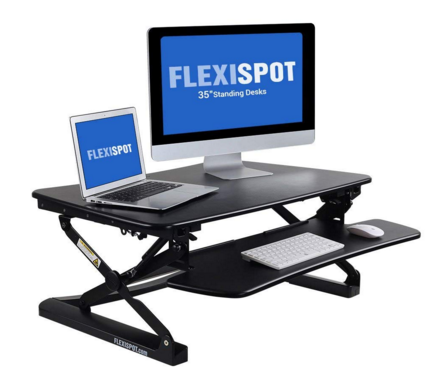 As just mentioned, the FlexiSpot M2B Standing Desk is one of the largest standing desk converters. Since this converter will be your workspace, as you will not want to be bending down constantly to reach items from your regular desk. You will want as much space as possible. This standing desk has two specific sections. The top section measures 31 inches wide by 23 inches deep. This is large enough to place two full-sized monitors on the desk as well as possibly a few odds and ends. The bottom section of the desk measures 35 inches wide and 10 inches deep. If you do not use this keyboard tray, it can be removed entirely. The entire riser measures 5.9 inches when fully collapsed and can be as tall as 19.7 inches when fully raised. The base measures 22.3 inches deep on either side. In total, the standing desk converter weighs just over 50 pounds. The standing desk converter is available in just two color options: black and walnut. FlexiSpot offers larger standing desk converters as well for those who need the extra space. Also, the standing desk converter is easy to assemble. It takes just one simple step. The most unique feature of the FlexiSpot M2B Standing Desk is its ability to rise straight up and down. Most other desk converters will move forward as they rise. This can take up extra unnecessary space. This desk converter eliminates this extra wasted space with its unique X bar design that lifts the desk straight up. There are twelve specific height levels that the desk converter can be locked in. The converter has a total weight limit of 35 pounds. While this desk is one of the tallest desks when it is raised, it is also rather tall when it is fully collapsed as well, making it awkward to use from a seated position. At the smallest setting, the converter sits your computers at 5.9 inches above the desk area. Even when you are sitting on your desk chair fully raised, this height can put a strain on your wrists. Varidesk is a company who’s focus is to create items for your office space that will help create a healthier lifestyle while at work. Varidesk is not just a leader in the standing desk industry, they are the originator of the industry. They have created many chairs, desks, and foot mats to make it easy to be both active and work a desk job. With all their high quality products focused on this one goal, it is no wonder the VARIDESK 49900 – Height-Adjustable Standing Desk has stood out as one of the best standing desk converters. The VARIDESK 49900 – Height-Adjustable Standing Desk is decently large. It measures 36 inches across. There are two sections to the converter. The top area where a computer monitor should sit measures just over 12 inches deep and is 17 ½ inches from the bottom of the converter. That is the maximum height of the converter. When the converter is fully collapsed, it raises your monitors just 4.5 inches from your desk. The lower portion of the converter, where a keyboard should sit, measures just over 14 inches deep. The base of the converter measures 24 inches deep. In total, the VARIDESK 49900 – Height-Adjustable Standing Desk weighs just over 52 pounds. This larger workspace is large enough to hold two monitors as well as a keyboard and a mouse. The converter is available in four different wood colors. The converter comes fully assembled right out of the box, making it very easy to set up and use right away. The VARIDESK 49900 – Height-Adjustable Standing Desk sits stably on your desk using a weighted base. It uses a posture curve and a rowing lift to raise the desk. This lift brings the desk closer towards you as you raise the desk. Note that it is easy to raise the desk and takes minimal effort on your part while causing very little strain on your back. The rowing mechanism is spring assisted. In this way, you can easily lift up to 35 pounds with very little effort. There are eleven individual height adjustments along the way between the 4.5 inch collapsed state and the full 17 ½ inch raised state. 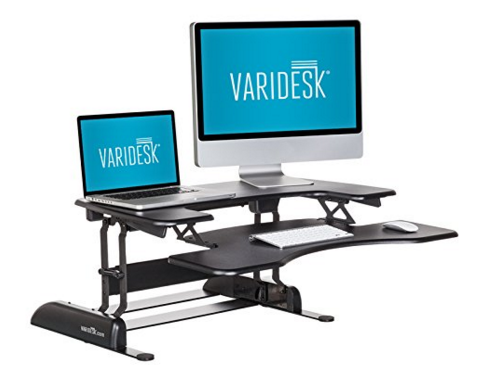 Veridesk has one of the most expensive standing desk converter options. The price would make sense if it reflected in a feature that was unique. But everything on this desk can be found in the more affordable standing desk options as well, making the price mainly about paying for the name brand. The VIVO Electric Height Adjustable Standing Desk has one huge advantage over the other two options – it’s electric! The electric part of the standing desk makes it so much easier to adjust. This convenient feature makes this adjustable desk option worth mentioning as one of the best standing desk converters. The VIVO Electric Height-Adjustable Standing Desk only comes in one color (black). However, it is a very large convertible desk, measuring very similarly to the Flexispot desk, except this desk is raised even higher in its fully collapsed state. The VIVO Electric Height Adjustable Standing Desk measures 35.25 inches wide on the top of the desk and 23.25 inches deep. The keyboard shelf measures 35.3 inches wide while the base is 21.75 inches deep and 32.5 inches wide. The keyboard shelf can easily be removed if you do not want to use it. The desk does have a monitor mount. This allows you to attach any monitor that uses a C-clamp right on to the desk for more stability. This desk easily changes height with a simple click of a button. The VIVO desk requires the least amount of effort out of all the desk converter options. When fully collapsed, the desk measures 5 inches. When it is fully expanded, it measures 19 inches. Unlike the manual desks that have a set amount of height levels, this electric desk has an unlimited number as it can be locked in place at any point. Just like the Veridesk, this desk also expands outwards as well as upwards. In total, it can hold up to 33 pounds on the desk, making it one of the lightest weight limits out of the top three best standing desk converters. Since this desk is an electric desk, it has the convenience of a USB port on the side so that you can charge various items without having to reach back down to your regular desk. The VIVO Electric Height Adjustable Standing Desk is one of the thickest desks when fully collapsed, coming in at 6 inches tall. This can make it very awkward and difficult to use the desk from a seated position and can result in wrist issues. It is best to use this desk only as a standing desk. It also has one of the lightest weight limits. This can be extra difficult to remember as it is also one of the largest desk areas. It can be easy to overload the desk. If you are looking for the best standing desk converters, at the most affordable price, you should consider the Standing Desk Converter by Smugdesk. It has some of the best quality features at nearly half the price of some of the other converters mentioned previously. 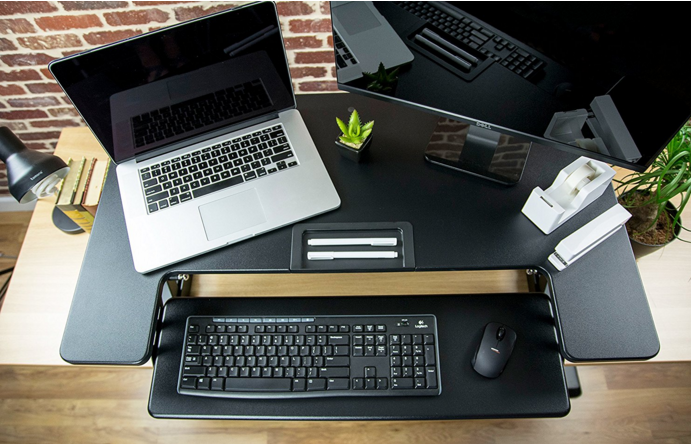 The Standing Desk Converter by Smugdesk is only available in black. The top part of the standing desk converter measures 31.89 inches wide by 24.41 inches deep, being just 16.73 inches deep in the center dip. The bottom keyboard level measures 23.62 inches wide by 10.23 inches deep. In total, the base measures 21.25 inches deep by 30.31 inches wide. These measurements are slightly smaller than the other desk options, except for the depth, making this one of the deepest desks. However, the height is where this desk is lacking. It begins at 6.69 inches as its lowest height and rises to just 15 inches at full height. The desk arrives fully assembled and ready to use. It has a maximum weight capacity of 35 pounds. 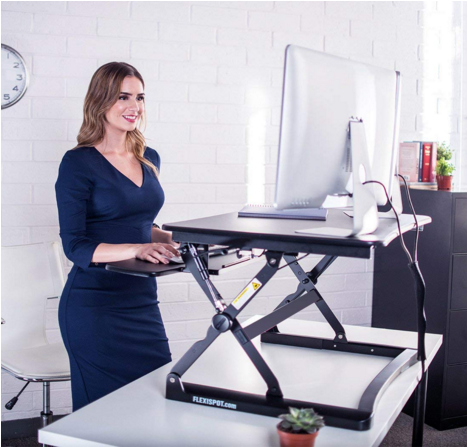 The Standing Desk Converter by Smugdesk lifts up silently using a Z-lift. This brings the desk both up and out at the same time. There are no specific locked positions, so it can be stopped at any time with unlimited height levels. All that needs to be done is to use two hands to grab both sides of the desk, squeeze the brake and adjust the height. Release the break to hold the desk at the desired height. This is one of the shortest standing desk converters. It does not rise above 15 inches tall, making it inconveniently short for taller people. In addition to being shorter, it also does not collapse very small, as it still measures 6.69 inches even when fully collapsed, making it difficult to use it in this state comfortably for people of taller heights. In total, this desk weighs just over 38 pounds, making it one of the least stable desks due to not having much weight to hold it in place. There are three main types of standing desks. What we covered today was only the standing desk converter. It is one of the most budget-friendly options, especially because you already have a desk to place it on. However, it is far from the only great option. The standing desk converter is a way to convert any desk into a standing desk. It is simply a riser that is placed on any desk of choice. It uses a weighted base to hold it stably on top of the desk. At this point, your new desk surface now becomes the converter, which can be raised to whatever level you need it to be. The standing crank desk is an actual full desk. It is much lighter in weight than a regular desk and does not have all the extra parts. The crank desk tends to only be two legs with a flat table across them. The simpler the design, the easier it will be to adjust the height. To adjust the height, you would need to manually crank the table to raise or lower it. Some crank desks require additional tools to do this, while others have all the parts attached to the desk at all times to make the process easier. The electric standing desk is designed just like the crank standing desk, except for one major difference. The electric standing desk does not need to be cranked manually. It has an electric crank that can adjust the desk quickly with a simple click of a button. It is faster and much more convenient to adjust, though it also comes at a higher price tag for this convenience. What are the health benefits of a standing desk? People were not designed to live sedentary lifestyles. Spending hours sitting in a chair can cause major issues with blood flow, resulting in blood clots, weight gain from inactivity, and just a general feeling of being tired that results from not enough exercise. If you ask any doctor, they will all say the same thing. Exercise is good. The more activity you have in your life, the better it will be for your health. This can be hard when your desk job requires you to be at a desk all day. This is where the standing desk comes in. A standing desk helps in many ways. First of all, it gets you out of the chair. The standing position is better for your blood flow. It also works more muscles than sitting. Plus, standing is better for promoting proper posture. Doctors recommend that a person who is sitting gets up for activity at least once every hour. Having a standing desk will allow you to switch between sitting and standing so that you will not grow tired from standing too long, but you will also be able to break up your periods of sedentary sitting. As soon as you start standing more, and break free from your sedentary position, you will soon find that your energy will also rise. With your rise in energy will come a rise in over-all productivity. What is the proper posture for standing at a standing desk? 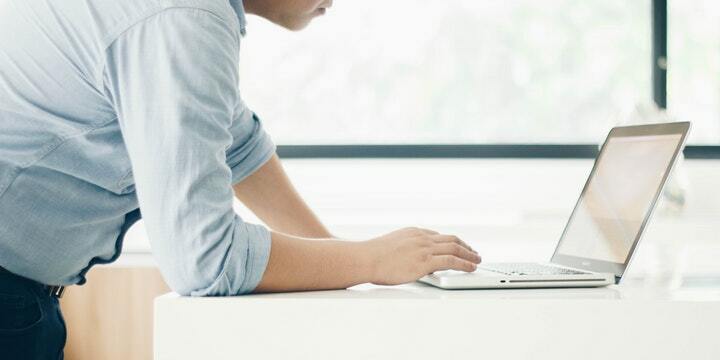 Just like there is a proper posture for sitting in a desk chair, there is also a proper posture for standing at a standing desk for the best benefits. Even standing can cause poor posture if not done properly. We have all seen that person who finds anything to lean on when standing, creating a bent over posture, which is far from healthy. Instead, we should practice proper posture while standing in order to glean the full benefits of the standing desk. When you are standing, be sure your feet are hip-width apart. You do not want to be slouching or else you are putting undo strain on your joints and muscles. Instead, when you have your feet at this width you are evenly distributing all your weight so no part of your body is being over-worked and worn out. A tired body part often times leads to slouching. If you are typing, make sure your hands are not above your elbow level as this is what can cause many wrist issues such as carpal tunnel. Keep the monitor just below eye level so you are not craning your neck to see the screen. You can sit back down if you start to feel tired. Do not force yourself to stand even if your body is starting to ache. This is when your body begins to slouch. Take a break and sit down so that you keep up the energy to remain in the proper posture at all times. What are some other ways I can remain active at my desk? You do not need to only use the standing desk only as a desk you stand immobile behind. A standing desk opens up a world of possibility for activities to participate in while at your desk. The main activity is to simply stand while working. This may feel hard on your feet so you may want to try a soft mat to stand on to help with the muscular strain it can put on you. You can also purchase a balance ball or other standing exercise equipment that you can stand on and have a small work out while working at your desk for an additional challenge. If you would like to be even more active at your desk, you can combine the standing desk with more intense work out equipment. Some people have added exercise bikes or treadmills in front of their desks. The standing desk will then raise your workspace. You can then still access your computer and equipment while you are walking on the treadmill. This type of workout is definitely not for everyone as it may distract from the office work that needs to be done. What is the best type of standing desk? While there is not a specific black and white answer to that question, there are some definite pros and cons to each of the standing desk types listed earlier. To start with, there is the standing desk converter. This desk is definitely the most budget-friendly option of all three. It is also one of the most versatile as you can turn any desk into a standing desk by simply adding the converter on top. This will allow you to choose a regular desk with the best storage options and shape that fits your needs. The main con with the converter is that the surface area is limited as you will not have the benefit of a full desk. It also tends to not have as steady of support as a full desk would have. The crank desk is a middle ground when it comes to price, while the standing electric desk will be the most expensive, but will be so much more convenient and faster to use. Deciding between the two will be a matter of cost over convenience. The rest of their features tend to be the same. These standing desks can stand on their own so there is no need for purchasing your own desk. They also tend to be much smaller than a regular desk so you will find you save quite a bit of space. With this less space also comes less storage space. Standing desks rarely have drawers or other compartments attached as they are built to be as light as possible to make it easier to convert quickly from one height to the next. If storage is important to you than you should look into a regular desk and simply add a converter on top. A regular desk with have more drawers and compartments for filing and storing office supplies. If you rather the convenience and extra durability that comes from a stand-alone standing desk, than either a crank or electric standing desk would be the best standing desk for you. This entry was posted in In Depth Product Reviews and tagged standing desk converter. Bookmark the permalink.